Did you know that pets can help put you in a better mood, reduce blood pressure, help with feelings of loneliness, and even reduce a person's stress level? There are many animals who have taken on the role of "therapy pets" to help people with special needs. I recently heard of one pet in particular who's story piqued my interest. Picaroon the Lovebird - Member of Furry Friends Pet Assisted Therapy Services. 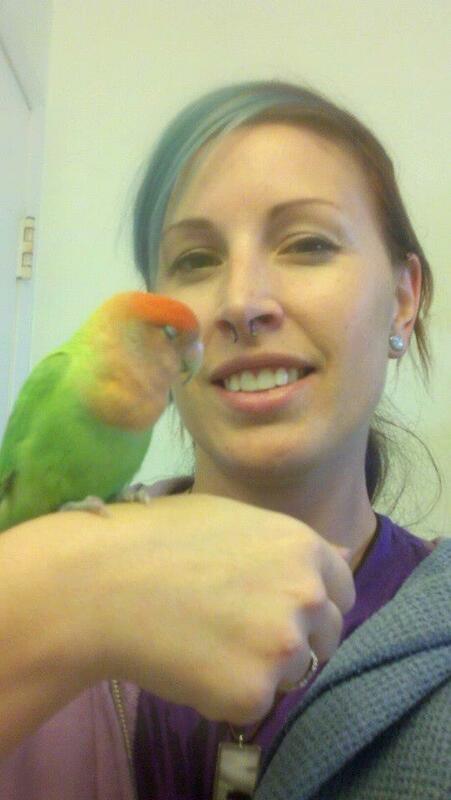 Her name is Picaroon the Lovebird and she's the first avian therapy pet that I have ever heard of. As soon as I read her story, I knew that I wanted to share it. Picaroon, whose name means "scoundrel" in pirate slang, came to her mom, Kymi, the day after Kymi's dog had lost his battle with lymphoma. Picaroon was found by Kymi's neighbor flying around outside and her previous owner was never found. So now she has lived with her new mom, Kymi, since 2012. Picaroon and her mom, Kymi. "One day I was flying around free when I saw a sad dog angel sitting outside a fenced yard. I was curious and flew down to talk to him (I'm not afraid of dogs or cats). He told me he was sad because he had to leave his human mom and he was worried about her. He had kept her happy and safe for 8 years and didn't want to leave her side. He explained he couldn't cross the rainbow bridge til he knew she was safe. I told him that every animal deserves to cross the rainbow bridge. If he needed someone to watch over his human, then why not me? The dog angel smiled and wagged his tail before crossing over the rainbow bridge." 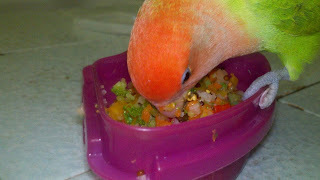 Picaroon is a 3 year old Peachface Lovebird (Red Opaline mutation). That just means that her feathers are a little bit different than normal Peachface Lovebirds. Her age is a guess from her veterinarian since she was adopted and her mom doesn't know her true age. She enjoys eating her Harrison's pellets, a tasty homemade veggie/fruit/seed mash, carrots, whole grain pita chips, and millet. Picaroon is enjoying a bite to eat! Kymi started taking Picaroon out into public once she got used to wearing her Flightsuits, which are basically a cute little birdy outfit/diaper that you can attach a leash onto. Soon Picaroon became very fond of going out and meeting new people. This makes Picaroon very special because most lovebirds only bond with one special human or another bird. Picaroon in her Santa Flightsuit. "The Furry Friends mission is to consistently facilitate delivery of the love and affection of our volunteers and their pets. We enhance the lives and touch the hearts of people with special needs." 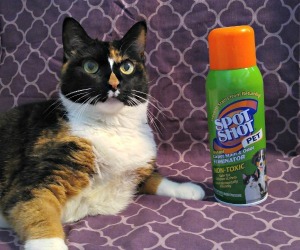 Before becoming a Certified Therapy Pet, Picaroon had to pass some testing to make sure she was a good fit for the job. 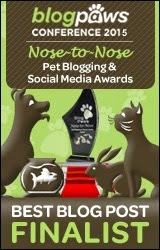 She officially became a Certified Therapy Pet on November 18th, 2012. Picaroon visits people in two different nursing homes and a brain and spinal trauma unit at a hospital with other groups of people and their pets who are also therapy pets. There are a few things that Picaroon and her mom do to prepare for their visits. Picaroon takes a bath to get nice and clean. She also has her nails trimmed often so that they aren't too sharp and pointy. Every few months, Picaroon has her beak filed down a bit too. She doesn't bite, but sometimes she does use her beak to grip and doesn't want to hurt anyone. Then, Picaroon decides on which one of her many flightsuits she will wear. "When I'm at a visit I meet a lot of different people. Some people like to have me perch on their hand. Some people give me head scratches or pet my back. Sometimes they just like to look at me on my human's hand and listen to stories about me. At the brain and spinal trauma unit, sometimes there will be a person who isn't able to hold or pet me so my human will hold me and gently touch me to the person's hand or fingers so they can feel my soft feathers." Picaroon has even been able to help someone overcome their fear of birds during one of her visits. One lady at the nursing home was scared of birds, but after watching all of her friends hold Picaroon she wanted to give it a try. After holding Picaroon, the lady was very excited to have overcome her fear. "My job is to bring people smiles and I think that's the best job a little bird could ask for!" 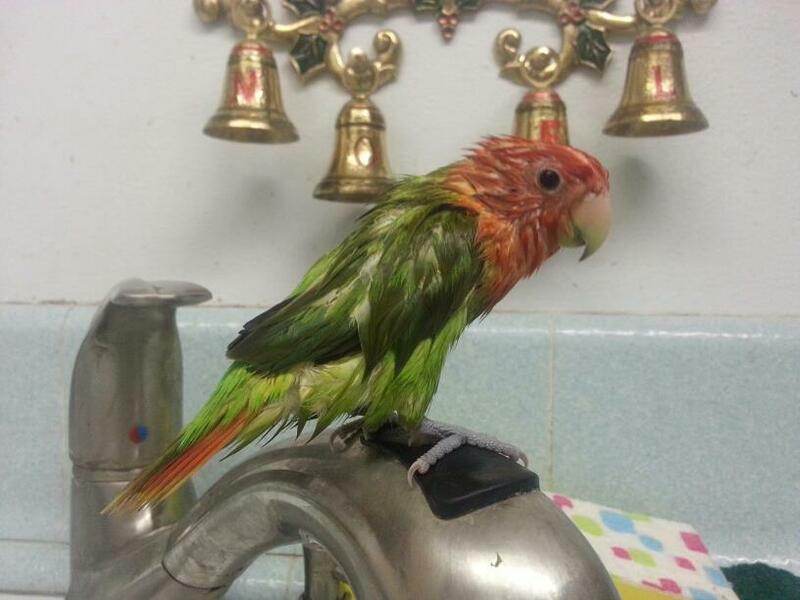 What does the future hold for Picaroon the Lovebird? In February, she hopes to pass a test to become a "Reading Buddies" member to help children read. "Birds make great pets for those with the time and attention to give them. There are lots of GREAT bird rescues out there that can help match you with a good feathered companion. Do your research and see if adding a bird is right for your family." 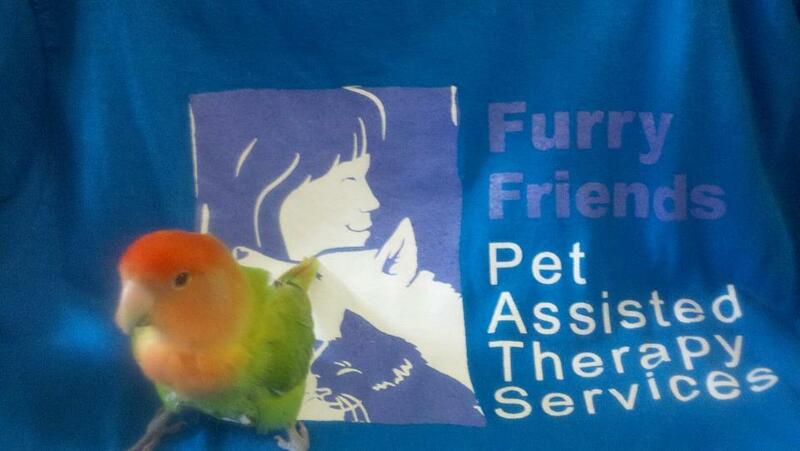 Kymi recommends visiting The Avian Welfare Resource Center if you are considering adopting a pet bird. It's a website with a list of captive bird rescue and placement organizations from all over the world. All photos are courtesty of Kymi Waters. 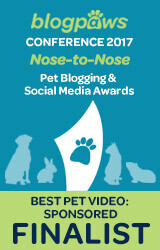 Please be sure to go visit and like Picaroon the Lovebird on her Facebook page here! Picaroon is SO beautiful. How wonderful that she's able to make a difference in so many peoples' lives. ...I'd love to see her wardrobe of flight suits!!! Thanks for sharing this incredibly cool story. Yep we agree, amazing and beautiful story. Have a super Sunday. Picaroon is awesome! I would like to shake her paw (wing)and be buddies. I also work as a therapy pet at the VA Home and the public library. I LOVE Read-to-a-Pet-Night. I think Picaroon will too! What a beautiful bird..and I didn't know you could give a bird a bath! Happy Sunday! It's much easier than bathing a cat or a dog, just give them some water and they do the rest! That is really neat. Thanks for sharing! Oh Picaroon, that is soooo pawesome what you do to help brighten the days of people who need a bit of love and a soft touch. Purrs to you for this! 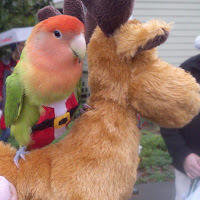 Wow, Picaroon is really cool bird! Beautiful and talented too :) I did not even know birds do therapy stuff! And I really like her flight suits...I wonder if I wear one if I will be able to fly? What an amazing story. It brought tears to our eyes. Thank you so much for sharing it. It's wonderful that Picaroon is able to touch so many lives. That is a great story. What a great bird Picaroon is. How neat that he wears a little harness when he goes out.